Due to unforeseen circumstances with my client I’m currently without a contract and am a man at leisure and luckily it’s coincided with some real winter weather. So, rather than focus my efforts on finding another job and providing for my needy family I’ve instead decided to take in some walks in the snow. Seems only fair. Last week before the “big” snows I took myself off to the Berwyns for the day having been meaning to pay them a visit for a couple of years. In hindsight it probably wasn’t all that clever an idea. I’d been up most of the night with what I hope isn’t, but fear is, a recurrence of kidney stones (very painful) so driving 2 hours on no sleep and dosed with painkillers was perhaps a little foolish. Still it was a cracking day not to be wasted. 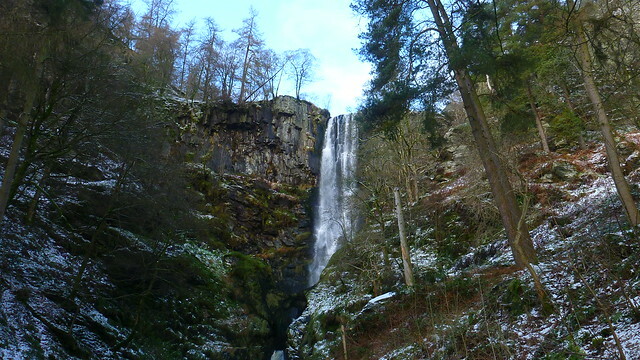 It was a long cross-country drive to my planned start point with a route planned from the east near the stunning waterfall of Pistyll Rhaeadr. The road up the valley was like a roller coaster and covered in compacted snow making for an interesting drive. As I barreled down the final hill to the car park I wondered if I’d be able to make it back up the hill again, a concern heightened by the fact I could barely turn the car round in the ice rink masquerading as a car park. Still, too late to worry about it now. The waterfall itself is mighty impressive even in the low flow with its water supply higher up largely frozen. 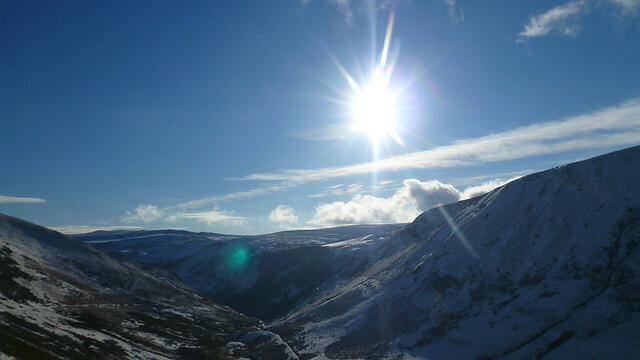 I believe it’s the highest in Wales and will deserve another visit when I have more time to do it justice. I set off around 11 after a brief look at the falls. 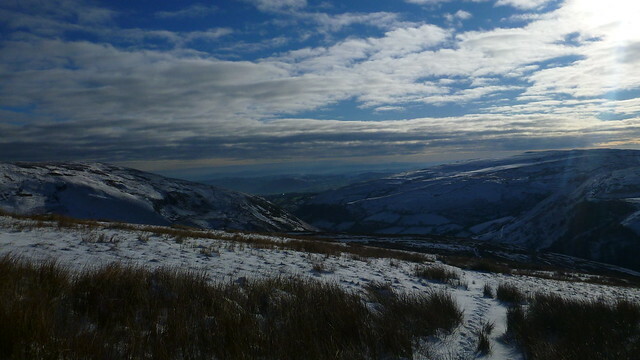 My route was to take in Moel Sych and Cadair Berwyn and complete a circuit of Llyn Lluncaws. 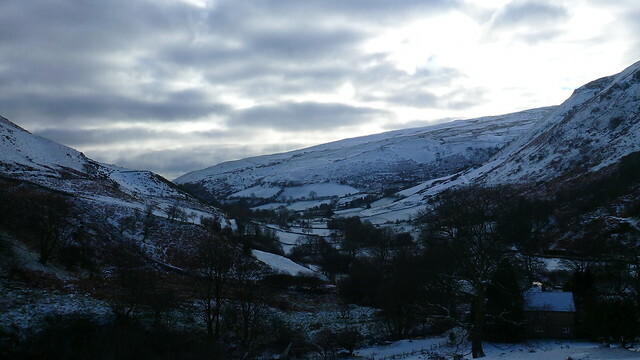 The snow covering in the valley was pretty thin but as soon as Igained a bit of height it deepened markedly. The summits were covered in clouds but the views to the east and over the nearby Hirnants were awesome. The bright sunshine gave me a chance to try out my new shades (a pair of Julbo Explorers and mighty fine they were). I was lucky to be following a fresh set of footsteps to make the deep snow a little easier and I could see my saviour in the distance. Alas, as I progressed upwards onto Trum Felen the cloud came in all became white. Luckily for me, and VERY unluckily for my distant trail-maker, he found a couple of very nasty looking bogs that saved me from falling into their traps. I traversed past them with a rather nifty move along the fence and continued up. 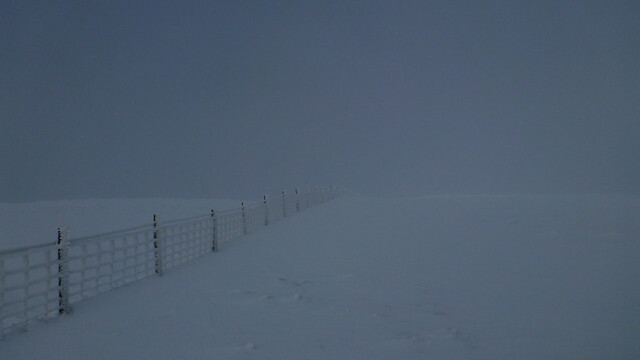 The snow got deeper and deeper and some of the drifts were thigh deep making for laborious progress. Unsurprisingly I reeled in the distant one who’d stopped for a breather. His name was Dave and a thoroughly nice chap he was too. We shared our surprise at the depth of snow, the lack of sun and the uselessness of crampons in such conditions (he’d had the good sense to bring a pair for full winter conditions, I hadn’t). I said I’d press on to the top and try to return the favour by breaking trail. The snow from there became unfeasibly deep, waist deep in places, some of the deepest snow I’ve walked in for perhaps 15-20 years. Dave soon caught me up as by now I was really feeling the combined effects of the tough conditions and a lack of sleep. We both managed to make it to Moel Sych and reached the cairn without using the stile over the fence what with it being buried under 2-3 feet of snow. I’d planned to walk around the head of the cwm to Cadair Berwyn but the cloud and my state of exhaustion meant I really couldn’t be bothered. 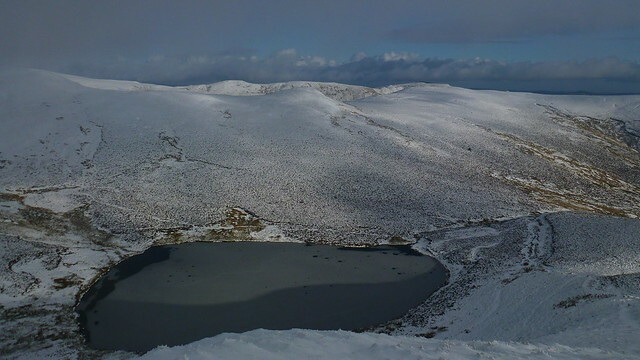 Dave pressed on so I wished him well for a good day and sort plunged and rolled down the slopes towards Llyn Lluncaws. Just above the Lake I needed a rest and stopped for a brew and lunch. Time to try out another new piece of gear, a Rab Infinity Down Vest that was mightily warm. Same can’t be said of my feet which were soaking wet and cold on a account of the quite stupid oversight of not bringing gaiters. I had snow trapped inside my trousers halfway up my leg but at least I had my thermals on – well I would have if I’d had the foresight to wear them. 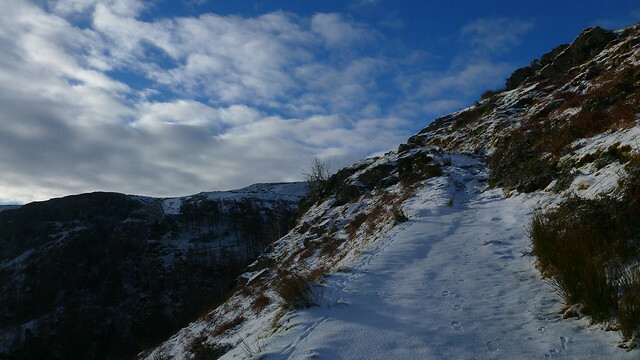 I was feeling a little out of sorts as I headed down but then right on cue the clouds parted, the sky turned a deep blue and the Berwyns were revealed in dramatic snowy splendour. 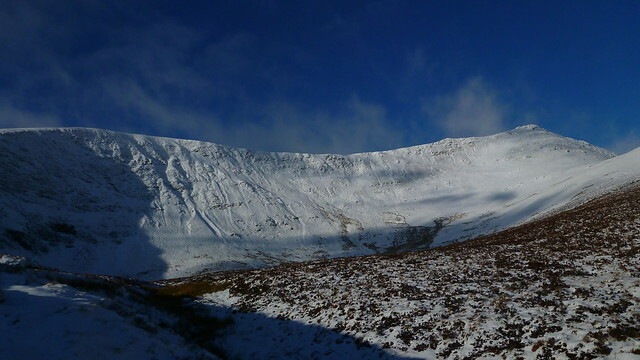 The edge looked magnificent coated in ice and snow and backed by azure canvas. I thought of my friend from earlier, pleased that his effort to get to the top had been rewarded with a clear view. The walk from the Lake down the Nant y Llyn valley was an absolute pleasure in the warm sunshine and lifted my sagging spirits infinitely. The spring in my step was back. By way of celebration I tried out my third piece of new gear, my Kahtoola Microspikes. The long easy path was mostly snow so they weren’t really needed but what I can say is that they are really easy to put on (much easier than crampons) but they ball-up even worse than crampons do so it was an interesting experience. They needed a more realistic test on ice which they got a couple of days later. It was still pretty early and I was tempted to stay out in the clear air. However I was still a little washed out and a bit paranoid about the drive home so I just plodded down this glorious valley in the sunshine. 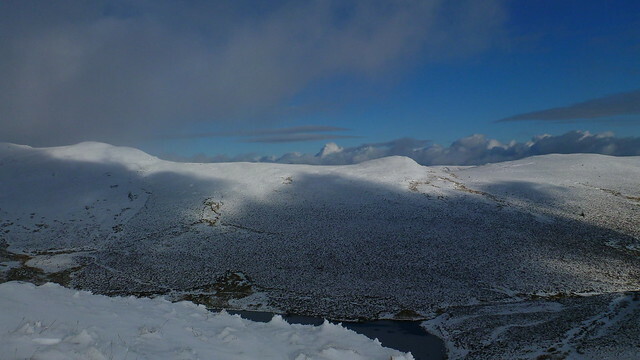 As I turned and looked back to the high tops I noticed that they were covered in cloud again so the weather window on the summit had been a brief one. I was back at the car for around 2:30. A short day and not what I’d planned but a good one nonetheless. Better than being at work at least. The drive home was uneventful apart from a 20 minute stop for cramp causing several passers-by in the village to show concern for my welfare as my legs buckled into unfamiliar shapes. Nice one matey. Know where I’d rather be ! Sorry to hear about the possible Kidney Stones – I vividly remember the horror stories from last time. I hope you get things sorted out with the minimum of pain and inconvenience. 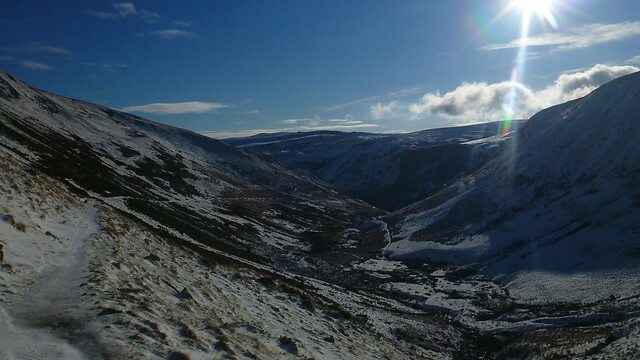 The Berwyns look very fine under snow and that waterfall is most impressive. Glad you intend to go back – I’m still up for meeting you there (although preferably when the days are getting a bit longer). Nice winter shots – quite a contrast from the very green landscapes of other seasons! 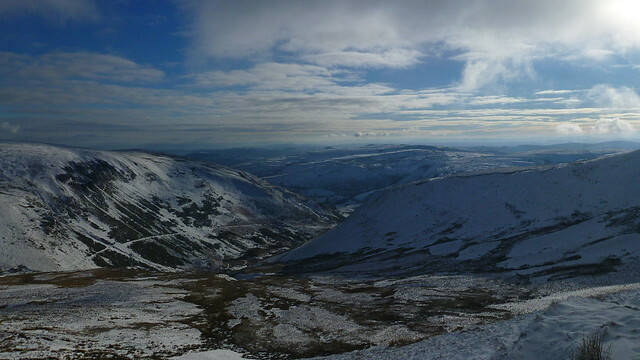 The amount of snow on the tops was amazing, needed a pair of snowshoes like yours! Love the photo’s, it’s great not working for a while get out there and enjoy. Just subscribed to your blog so I’ll be taking a look through your stuff when I get back from skiing in France next week! 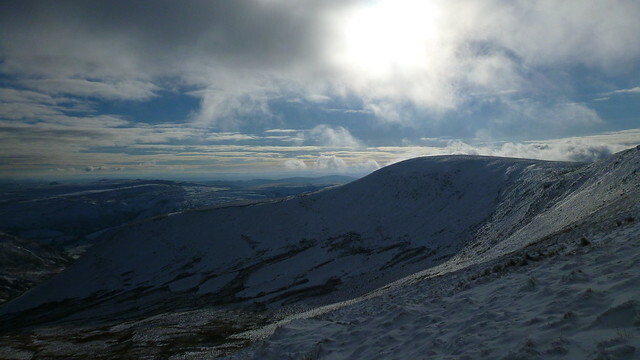 Lovely photos there – even like the atmospheric, low cloud one. Shame you weren’t feeling too good – hope things are improving now. Been using my microspikes a lot recently, and really like them so far. I have had some balling up in snow, but most of the time the lumps seem to fall off on their own, or I’ve just hit them occasionally with a walking pole and they’ve broken off then. Been indispensable walking round the village etc on ice-rink pavements too! I couldn’t work out mind, why at the weekend on a longish walk, Geoff had his on all the time and didn’t seem to get any balling up at all. He said it was mind over matter………..he does talk some rubbish sometimes…….. Thanks Chrissie, if it is Kidney Stones at least I know what’s coming and how to handle it. Was a superb day, very lucky (or unlucky depending on your point of view) to be able to experience it. 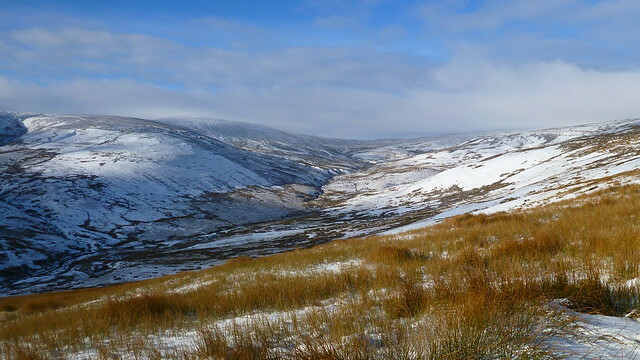 The Berwyns are a cracking underated group of hills. You picked some good weather to explore! 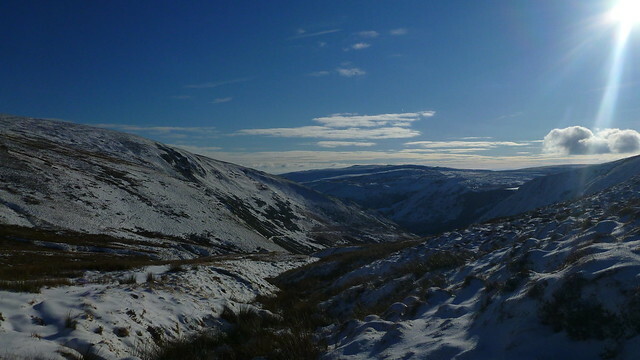 It was similar the last time I was there, I did not make the summit http://backpackingbongos.wordpress.com/2010/02/06/beaten-by-the-berwyns-godor-moel-yr-ewig/ The campsite near the waterfall is a bit of a gem, the owner was good enough to tow me out by tractor when the Bongo got stuck in the field in snow. If you head to the Hernants you will see why no one heads there after a few minutes of waist deep heather! Just checked out your post, remarkably similar day to mine. Considering what I think was underneath all that deep snow I’m not sure it made it any harder. The bog that the guy I was following fell in looked really nasty and those tussocks are something else. Superb spot though. A well captured weather window there with fine shots and good light. *I* head to the Hirnants now and again, I have a few routes covered. Excellent for solitude if you relish a bit of a challenge. Thanks Geoff, I need to do a much longer walk in the Berwyns, they are a very underrated group. Never even knew the Hirnants were there until I found them in a guidebook. Rough, wild and heathery seems to be the general vibe!